Winter has approached on tiptoe, crisp and fog laden, but that hardly puts a damper on the Bengali spirit, for it is time yet again, to indulge our taste buds and take a delicious bite out of the Pitha. This delicacy is a favourite of many, of both the poor and the wealthy. Sumptuous smells fill the early morning air as wayside vendors both men and women make Chitoi and Bhapa Pithas on small clay ovens on the street sides, while homemakers hold Rosh and Pitha parties at their homes. The festive mood, somewhat faded after Eid, is rekindled for those who choose to make the arrival of this Bengali delicacy an occasion in itself. 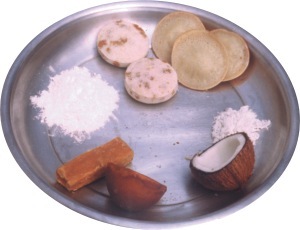 There is an array of different kinds of Pithas at your fingertips, besides the popular Bhapa (small cakes made of grounded rice grain,) like all other Pithas; it is soft in texture and filled with molasses) and Chitoi. Not all pithas are necessarily sweet. Plain Chitoi for example can be savoured with a bit of shorshe bataa (mustard paste), meat or even pickles. There is also Dudh Chitoi, or Chitoi soaked in a mixture of milk, molasses and coconut shavings. Pati Shapta is another treat, stuffed with khirsha, a creamy filling made out of milk and sugar. Then there is Puli, which are crescent shaped dumplings stuffed with coconut and molasses, and Dudh Puli, the same dumplings soaked in thick, sweetened milk. Semai Pitha is thick, elongated strands of rice dough soaked in a thick, creamy custard-like mixture.) If you want to sink your teeth into something hard and crunchy, try the Nakshi Pitha, which has a light, sweet flavour. These come in interesting snowflake-like shapes, and are intricately designed in the middle with palm tree thorns. Nakshi Pithas are fried on heated molasses syrup. Poa Pitha, like the Nakshi Pitha has a light, sweet flavour. It is fried, and has a reddish tinge. There are regional pithas such as the Mera from Comilla, and the Bibikhana Pitha, which is a specialty of Bikrompur. If you don't know how to make Pitha yourselves you can always purchase from Pitha Ghor (32 Bangabandhu Avenue, Dhaka 1000). The shop offers almost all of these treats, and others can be ordered such as the regional pithas, so wait no longer. Indulge in a delicious slice of pitha! Like it or not, winter has arrived a little early this year. This means that you're going to have to start pampering your skin with a little extra attention. If you fail to do so, you'll be marring your radiant looks, and eventually end up looking like a person living the final years of his/her life. Taking extra care of your skin doesn't involve much hassle really, and so you need not fret. Simply applying a little moisturising lotion will ensure that you'll hold onto your beloved youth. Moisturising lotion is available at nearly all supermarkets in Dhaka. Depending on brand and whether it's local or foreign, the price of moisturising lotion ranges between Tk 80 to Tk 500. Winter doesn't mean that you'll have to be unfashionable. Even while being wrapped up, you can give strong fashion statements. A shawl is one piece of clothing that will enable you to do exactly that. By wearing a well-designed shawl, you'll be protected from the chill of winter and at the same time men will admire your taste of fashion. For purchasing shawls, we suggest you that you go to New Market. Prices at New Market will depend on your ability to bargain. However, for a rough guide we can tell you that the prices will range from Tk 400 to Tk 5000. If you happen to live in Uttara, you can check out Family Needs (Sector # 3). They've got a fairly decent collection of shawls, and they're priced between Tk 600 to Tk 3000. Food tastes good, but if you don't do regular exercise you'll end up with a 'bhuri'. From this writer's personal experience we can tell you that women generally don't like men with 'bhuris'. Likewise, women with 'bhuris' aren't a very tempting prospect for men either. In order to ensure that you don't get a 'bhuri' and manage to stay fit and healthy, purchase a skipping rope and carry out regular exercise with it. At Shaheen Sports (Hockey Stadium) you'll be able to buy a skipping rope within Tk 200. If you swim regularly or are planning to do so, you might want to consider purchasing goggles. This is because by using goggles you'll be able to protect your eyes from the chlorine that swimming pools contain, and consequently forget about returning home with "red eyes." Goggles can be purchased for Tk 400 at Shaheen Sports (Hockey Stadium). Now that we've told you how to solve your problem of getting "red eyes", hopefully one of you will concentrate on your swimming and become as good a swimmer as Australia's Ian Thorpe. Nearly all of the 50 or so private universities in Bangladesh offer BBA degrees. With so many business graduates coming out each year from these private universities, the competition for jobs is intense. Is there anything you can do to give yourself a little competitive edge? Well, yes there is. By regularly reading business magazines you'll be able to be aware about the developments in the business world and also be able to see how your theoretical knowledge is applied in the real world. One business magazine that we strongly recommend is The Economist. It is available at all quality bookstores, and is sold for Tk 150. Some say that they hate the violin because they feel it's a musical instrument that cries. There are also some who find the music produced by a violin to be absolutely enchanting. In case you are somebody who shares the thoughts of the latter group of people, you might want to purchase a violin in order to try out your own talent at the instrument. At Surniketan (28/B Dhanmandi, Road # 1) you'll be able to purchase a violin between Tk 2600 to Tk 3500. Human conflict goes as far back as Cain and Abel, and will probably last as long as there are two people left to argue with one another. Arguments are what can either add spice to a relationship, or poison it. They can either help iron out any problems between two people, or they can add to them by bringing an element of hostility into the equation. So how can two people resolve their outstanding issues without walking out of the encounter feeling bitter and hurt? There are some simple conflict management strategies, which, if followed, can really make a difference. You've probably noticed how a steamroller crunches over the tar and asphalt on a road, crunching down anything in its wake. There are some people who actually behave like that in a conversation, just going on and on with his/her own argument, without giving the other person a chance to speak, or listening to the arguments of the other person. This is called 'steam-rolling', and not only does it not solve anything, it results in making the recipient even more angry at the steam roller. When you find yourself in an argument, try taking turns at speaking. Give the other person a chance to speak, and when s/he does, listen. Try to see it from the other perspective. It'll help you reach a mutual beneficial arrangement. Don't you hate getting a recap of all your past misdeeds, followed by a future projection, whenever you fight with someone? When you store a lot of grievances in your emotional gunny-sack and open the floodgates during one single fight, the person on the receiving end will at best listen to five minutes of your nagging, and then tune you out. Which leaves you with a hoarse throat and an issue unsolved. So if you want to get maximum mileage out of a fight, focus on the 'now', and leave the 'yesterday' and 'tomorrow' where they belong…out of your conversation. The Silent Treatment is a weapon we've all used at some point or other in our lives, and it's very effective too, at least in the short run. If you're looking at the long run, giving someone the cold shoulder every time you fall out with that person isn't going to solve anything. If an issue needs to be addressed, it's much better to sit down and discuss it calmly and logically, without using emotional blackmail. Nothing sours up an argument quicker than personal attacks aimed at the opponent's self-esteem. If the conflict is supposed to be constructive, then stick to the deed, and not the doer, and you'll make more headway. We're only human, and it's easy to get carried away in a fight. However, by being just a little rational, and just a little considerate, we can make the fights work for us, instead of giving the aspirin-makers extra business.